Picadilly Farm is located in Winchester, NH. Jenny and Bruce Wooster have been farming around the country since the mid-'90s. 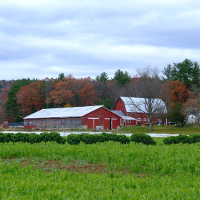 In 2006, they moved to the White Mountain State and set up shop on a 71-acre plot of land half a mile from the Connecticut River and called it Picadilly Farm. The Woosters grow some very delicious certified organic vegetables.